Qualcomm today issued DMCA takedown requests to code repository host GitHub, taking out over 116 different code branches and repositories, alleging that they are infringing on the chipmaker’s copyright. Cyveillance has recently discovered the unauthorized publication, disclosure, and copying of highly sensitive, confidential, trade secret, and copyright-protected documents on the below web site. Specifically, we have confirmed that the documents whose locations and filenames identified below are confidential and proprietary to Qualcomm and were posted without Qualcomm’s permission. Cyveillance is authorized to act on behalf of QUALCOMM Incorporated and Qualcomm Technologies, Inc. (collectively, “Qualcomm”) in requesting removal of its copyrighted works from Internet sites. Under the U.S. Digital Millennium Copyright Act (17 U.S.C. § 512) and other applicable U.S. and international statutes, Cyveillance provides this notification of claimed infringement and requests that you immediately remove certain documents from your web site and/or disable access to those documents through your web site. The unauthorized copying, disclosure and distribution of Qualcomm’s confidential trade secret and/or copyright-protected documents constitute a violation of both civil and criminal trade secret and copyright laws. If you are disseminating or aiding and abetting the dissemination of these documents, you are violating Qualcomm’s intellectual property rights, and could be subject to severe civil and criminal penalties. Based on our preliminary investigation, we believe that this web site is owned and/or controlled by you. Cyveillance, therefore, demands that you immediately (1) remove these documents from any of the web sites under your control and/or disable access to these documents through any of the web sites under your control, and (2) destroy any and all copies of the documents that you possess. We also request that you identify to us your source(s) for these documents, so that we may contact them and request that they delete and/or remove the documents that they possess as well. Qualcomm takes these issues very seriously, and may pursue legal action against individuals and organizations that take part in the unauthorized dissemination of its confidential trade secret and/or copyright-protected documents. We look forward to your prompt cooperation. Please send written confirmation of your compliance with this request to us and to DocCtrlAgent@qualcomm.com. Qualcomm is the owner of an exclusive copyright for each of these documents. Cyveillance is authorized to act on behalf of Qualcomm, and has a good faith belief that the publication and/or disclosure by your web site is not authorized by Qualcomm, any of Qualcomm’s agents, or the law. I certify, under penalty of perjury, that the information in this notice is accurate. Nothing herein shall constitute a waiver of any of Qualcomm’s rights in law or in equity, all of which are expressly reserved. Along with a CyanogenMod repository, the list of sites includes a couple of notable entries including Sony’s Xperia Dev Github repo, to which they recently began uploading kernel source for their latest flagship devices, in an effort to make good with the developer community. A further notable inclusion in the list is Qualcomm’s own github repository, leading to speculation that the sites included in the takedown list has been gathered by some sort of bot. The impetus behind the takedown request is a WiFi config file – literally a text file – which is taken straight from a Sony firmware release. 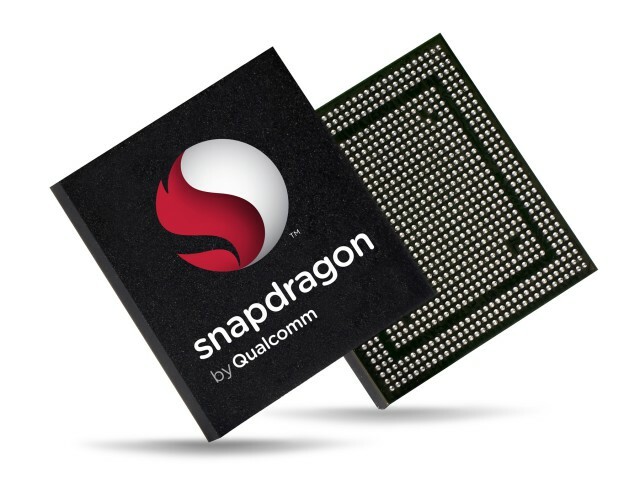 In this takedown Qualcomm also took down PRIMA mirror which is open source code for Atheros wireless chipsets that they release on the CodeAurora gitweb site. At this stage the CyanogenMod team are attempting to reach out to Qualcomm and sort out what they believe to be a misunderstanding. At the time of writing, there has been no response from Qualcomm, at least a public one. With an association with CAF through the QuIC, there should be some sort of amicable arrangement found which will allow developers to return to developing rather than become involved in legal wrangling. 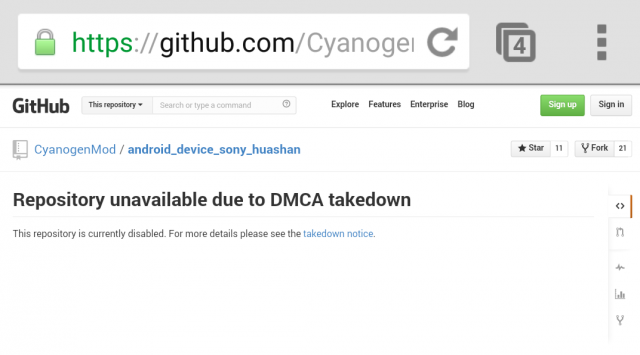 Until a response is received and the issues sorted out, CyanogenMod nightlies for the Sony Xperia SP – the only device affected by the takedown notice at this stage, have been turned off – but the effect could be felt on others named in the takedown. The takedown request should hopefully be resolved in the coming days, but nothing is certain. Qualcomm have done a lot of work with the open-source community and we have serious doubts that they would issue these takedown notices deliberately, without good cause. Qualcomm’s work with the open source Linux kernel community has helped advance mobile technology in the past few years and it would be a shame for this to be endangered. We look forward to reporting the resolution of this takedown soon. It appears that the takedown notice has been retracted. 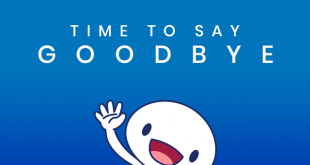 GitHub repositories affected by the takedown have begun coming back online. It was definitely generated by a bot. I’ve dealt with Cyveillance bots before, they run spiders with spoofed user agents all day against every site they can find, with no regards for robots.txt files, and no throttling limit. They just hammer everything in their way, looking for violations for their clients. We’ve got some absolutely massive IP blocks blacklisted to keep these guys from slamming our servers. It definitely seems like DMCA botcode gone haywire, because why else would it also go after Qualcomm’s own stuff. Exactly, it shouldn’t be the toothless threat of ‘penalty of perjury’ – any lawyer that put their name to a DMCA request that’s found to be incorrect should get struck off. That might concentrate their minds and kill the bots.